The Chris Arnold Experience, Kelli! Taylor & Jed Salisbury! 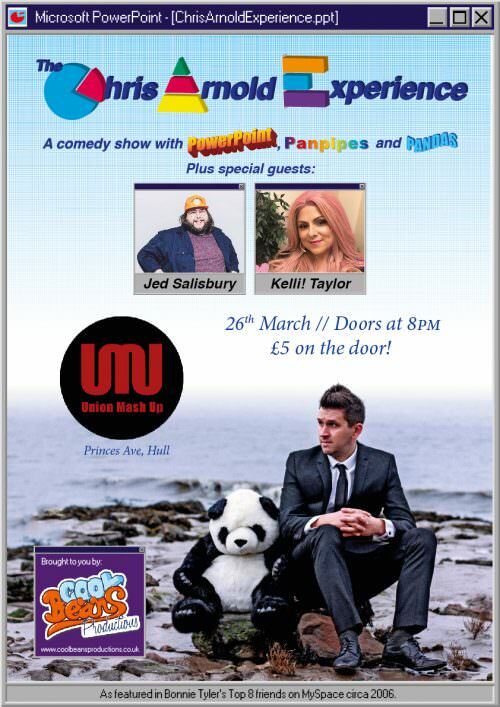 Lovely folks of Hull, a stellar line up of stand up comedy is coming to Union Mash Up this March! How many sets of panpipes should one man own? What is the best song request a DJ can get? How can the Daily Mail help you find out if your partner is cheating on you? And why on earth is a panda from Portishead sitting in the audience?! All these questions (and more) shall be answered throughout the course of The Chris Arnold Experience. Chris Arnold has appeared at the Edinburgh Fringe, Glastonbury Festival, Ibiza Rocks, Bestival and The British Musical Comedy Awards. He wrote, hosted and directed The Cool Beans Television Show which was up for a British Comedy Award alongside such stalwarts as Horrible Histories and Harry & Paul. He also briefly featured in Bonnie Tyler’s Top 8 friends on MySpace circa 2006. A high-energy, jolly young man with a warming charm and an innate sense of funny who has taken mischievous crudeness and belly-laughing cheekiness and mixed them with modern edginess to create a truly unique act! Since winning the best show of the 2009 Hull Comedy Festival, he has performed hundreds of gigs across the country, from bars and established comedy clubs to festivals. He even recently provided comedy warm up for BBC Radio 1’s Live in Hull weekend! Kelli! Taylor is one of the countries best stylists with a client list boasting of Rowland Gift’s mum, and Helen from Big Brother 2 or 3. No advance tickets, a simple £5 on the door! Bring your mothers and your brothers!